Our beaches draw thousands of visitors each weekend. The Oregon Coast invites families, couples, and singles from all over the world to come and explore our beautiful coastlines up and down scenic highway 101. Newport sits on the Yaquina Bay and feeds into the Pacific Ocean. We have officially ended what is known in our tiny town as the "tourist season" and gently rolled into our second summer. The second summer is something we learned recently from a local update we subscribe to. We get a few weeks of warm summer-like days that are sprinkled with rolling fog, misty mornings and cooler nights. The days are delicious to our souls. We savor each one with the knowledge that soon we will be cold and our homes will be hit with high winds and rain...lots of rain. Ten inches of rain in one month. Our nights find us walking along the beaches at low tide in search of finding treasures from the water. We find shells, driftwood and the occasional flip-flop. We find toys, shirts, shorts, dead birds, bits of jellyfish and abandoned sandcastles. On Saturday we headed to South Beach State Park over the Yaquina Bridge to check out a new beach. The beaches have similarities but each beach also has its own personality. Yaquina Head State Parks beach is covered in basalt. Little black rocks covering the shore. This creates a "shhhhhhh" sound as the water passes through each rock. Nye Beach has dunes for the kids to run up and down on. We have many beaches to explore close to our home. South Beach has shells. We are discovering stretches of the coastline that do not have shells. If they do, they are often busted and in pieces. This beach has a bit of both. I usually return home with a few "whole" shells. I clean them and add them to the table in our living room for the kids to touch, see and admire. I love bringing the outside indoors. My home is filled with bowls of rocks and shells.Vases with driftwood. Fake beach grass. Anything to remind me that we live at the beach. While walking, I stop and notice the sandcastle that is posted at the top of the page. It is covered with crab shells and a few broken sand dollars. I stand there for a moment looking and inspecting the sandcastle. My mind drifts in and out of our own family's escapades to the beach and building sandcastles. A smile gently rises to greet the warm feelings I am remembering. Heading to the beach empty handed is never an option. We must come prepared for epic expectations of building the largest sandcastle in town. Cory hauls our wagon through deep sand, laden down with shovels, buckets, sifters, rakes, gold panning pans, and towels. If we are lucky we return home with our beginning inventory, if not, then we have shared a bit of our family with the next beach dweller. It happens. Abandoned sandcastle sounds so lonely and deserted. It expresses the circumstances that most sandcastles meet at the end of a fun weekend or a single westward excursion to find some sand. We don't build sandcastles with the thought of leaving them behind at the end the day. We dream about the imaginary lives that will be lived inside, the battles that will be fought, and victories won. There is an experience that happens between the time a decision to build a sand castle is made and the final moments of realizing you must leave it behind. Minutes are devoted to the design, hours to the building and a few seconds left for goodbyes. It all happens so fast. Time does slip away when making memories in the sand. Our kids never want to leave. We don't want to leave either if I am being honest. Our sandcastles are abandoned as the weekend draws to an end. They are empty because families must return home to their busy lives. Adults work and kids have school and everything in between. Each builder leaves their sandcastle reluctantly, with a backward glance, as the tide slowly rolls in. A long day spent digging, packing sand, carrying buckets of water, and finding adornments. It ends. The deserted sandcastle will not be there in the morning. The tide will roll in and take back each grain of sand. The waves that have brought the sand to shore, pulls each grain back into the water. Pushing them farther and farther out to sea until all that is left in its place is a memory. Each day these memories are made for locals and visitors on the beaches of our Oregon Coast. At the end of each day or long weekend, we take with us the memories of building our sandcastle. The memories of time spent with family, friends and the sea. Next weekend will bring a new idea. New designs. New treasures to decorate with. More abandoned sandcastles are on our horizon. P.S. 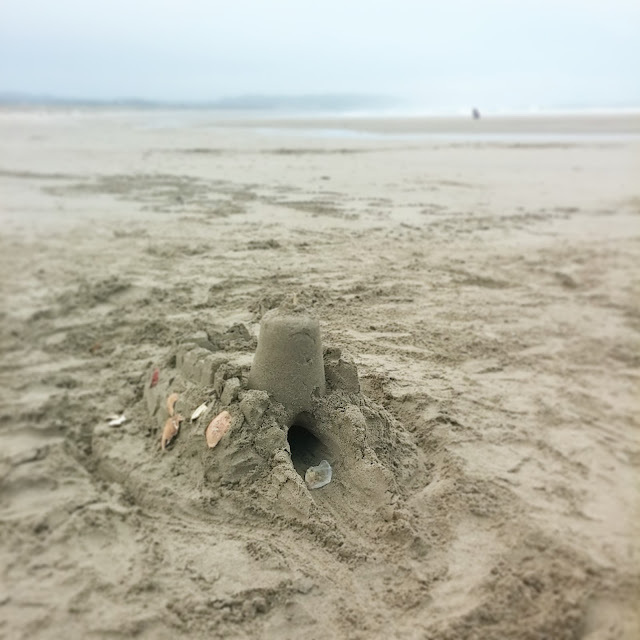 I would love to hear about your memories or stories of sand castles from your childhood or life. Does this essay spark a memory, cause you to return to the beach, remind you to make time for sand castle memories or all the above. Through sharing our stories we become a close community of like-minded readers and storytellers. I grow as a person and as a writer when I read your comments. Thank you for reading and I look forward to hearing from you. This weeks recipe is for Baked Avocado Slices. This weeks poetry is linked here. An ode to Autumn. Last weeks, Sifting Through Life is linked here. I talk about happiness.